In a flurry of high stakes trading the GOLD PRICE rose a superheated ten cents today to close Comex at $1,068.80. Silver lost nine cents to close at 1408c. Hot. The SILVER PRICE 23.5 cent range today took it to a high at $14.22 and a low at $13.985. Fifteen down days running, and counting. Way oversold. The GOLD PRICE hit $1,062.00 today, another post 2011 low, lower than the July low, but still refusing to break down. 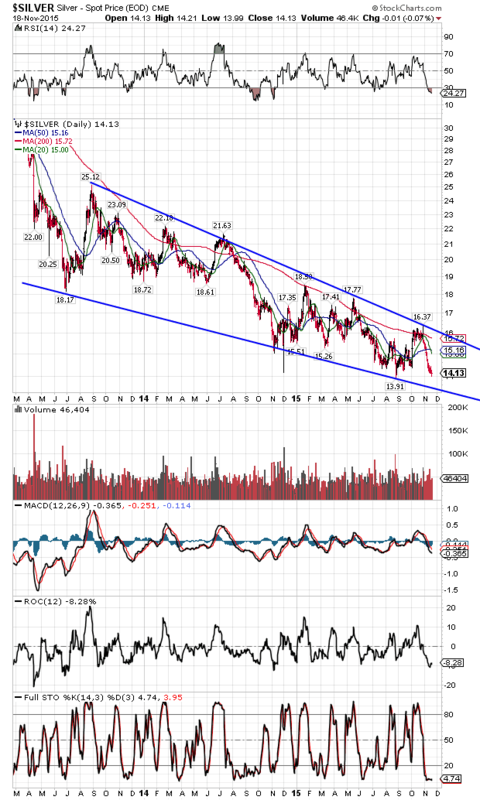 Only thing wondersome here is why silver and gold prices won’t break down. Here’s a theory. Look at this chart, Other than showing gold extremely oversold (look at the RSI up top), it shows a falling wedge formed since 2013. The price of gold is right now tickling the bottom boundary of that wedge. If it falls through, it will fall a long way. Moving averages are line up bearishly, so to reverse gold needs to climb above those first. Also, it would be helpful if it stopped falling. Probably not coincidentally, silver hath also traced out a 2-3/4 year falling wedge, even wedgier than gold’s, Silver has not yet reached that wedge’s bottom boundary, which appears to me to stand today around 1350c. Silver’s in the selfsame case as gold. Either turn around and prove it by conquering those moving averages above, or fall though that line till the mud stops you. 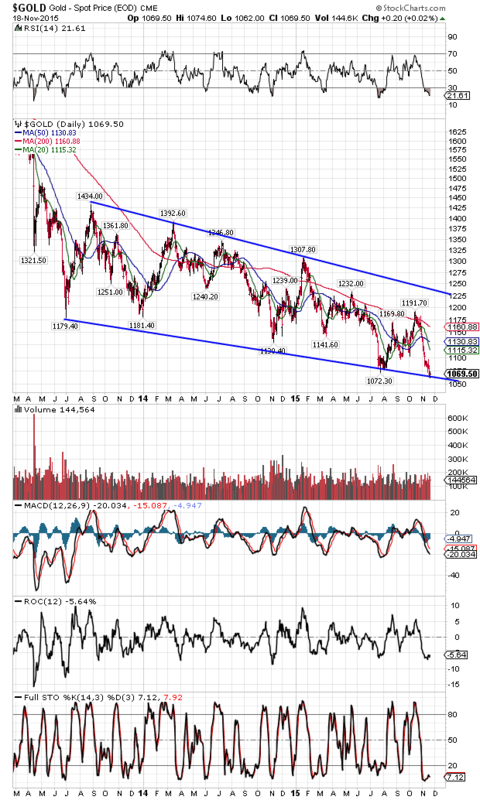 Both metals are oversold and edging down on dropping volume. However, both are also locked in a 4-1/4 year downtrend. I never saw two markets need PROOF so bad, proof they intend to turn around. I think they will, and I think it will happen here in November. But I still want proof. Sorry I missed y’all yesterday, but I had to take my wife and son to a movie and supper. It was the last day to see “Bridge of Spies,” which is an extremely engaging movie. Had shots of the Berlin Wall in 1960. When I was studying there in 1972-73 the East Germans had to install electric eyes to control the machine guns because the guards couldn’t be trusted to shoot every time. I miss communism almost as bad as I miss cholera. Heaping insult on injury, now I have to live under central bank communism. Markets were gassed again today by the hot and fetid breath of the Fed. October FOMC minutes were released showing a “solid core of officials rallied behind a possible December rate hike,” according to Reuters. Markets overlooked that the FOMC criminals also debated whether the US economy’s long term potential has permanently shifted lower. How’s that for optimism? But bulls hear what they want, and what they heard is — I reckon — that the Fed is bent on raising rates, so that must mean the economy is improving. Surprising reasoning, since the Fed raising rates historically drives the stock market lower. You! Logic! Shut up and sit down! Without trying to make sense out of all that, note that the Dow rose 247.66 or 1.42% to 17,737.16. S&P500 jumped 33.14 (1.62%) to 2,083.58. As that places both indices above their 20 and 200 day moving averages, expect higher prices. This doesn’t change my persuasion that the stock market topped in May. Today did post new highs in the Dow in Gold and Dow in Silver. Dow in gold hit 16.60 troy ounces versus July’s high for the post-2011 low at 16.50 oz. Dow in silver closed 1,259.65 troy ounces versus July’s 1,236.37. Without time passing there’s no way to judge whether these are double tops or beginning of another advance, in which case the Christmas goose and I have something in common. US dollar index, terrorist of scurvy fiat currencies, fell two basis points today. That does nothing to interrupt its present uptrend. All hail the Fed, Masters of the Universe, extraordinary economagicians! In Europe, where they can’t grow as robust a strain of central bankers, the euro rose 0.14% to a failing $1.0660. On its way to 90 cents? Yen fell 0.16% to 80.81. It’s broken, too.